The Lower Suwannee National Wildlife Refuge covers 53,000 acres surrounding 20 miles of the Suwannee River before it flows into the Gulf of Mexico. The refuge then extends for 30 miles along the Gulf coast of Dixie and Levy counties. This huge refuge has numerous recreational areas that deserve separate coverage on this website ... a project we will pursue as time permits. The main public headquarters for the Refuge is located along Levy CR347 southwest of Chiefland, Florida. Located just 200 yards from the Suwannee River, this location has a 6/10 mile long river trail and a 1/4 mile long bottomland boardwalk that take you into the hardwood swamps along the river. Further south on CR347 there is a self-guided nature drive that allows touring the refuge by car. The Shell Mount Unit at the south tip of the refuge is at the west end of CR326 in Levy County. 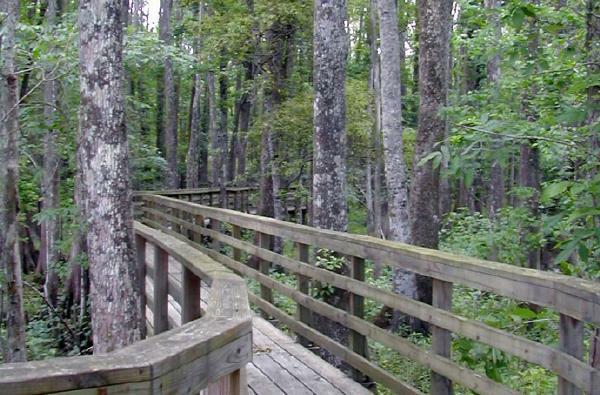 The 0.3 mile loop Shell Mound trail and the 1 mile loop Dennis Creek trails are located here, along with an observation deck. A 6,000 year old shell mound archaelogical site offers good views of the coastal area. On the north side of the Suwannee River, in Dixie County, you will find the quaint town of Suwannee at the mouth of the river. Further north along the coast, Shired Island offers campsites for paddlers of the Florida Circumnavigational Saltware Paddling Trail. Motorboat, kayak and canoe access to the Suwannee River and Gulf of Mexico is available at numerous locations within the Lower Suwannee National Wildlife Refuge. The most popular spots are at the south end of Dixie CR357, at the town of Suwannee, at the Levy County boat ramp at Fowler's Bluff, at McCormick Creek along CR347, and at the Shell Mount Unit.